To European readers Tibetan historiography is known from Tārānātha’s History of Buddhism in India, translated by two members of the St Petersburg Academy of Sciences, W.P. Wassilieff into Russian and A. Schifner into German. But this is not the only work of this kind which the Tibetan literature contains. There are many others. 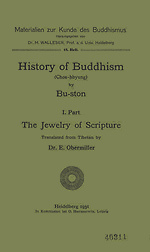 Among them The History of Buddhism in India and Tibet by the great scholar Bu-ston Rin-chen-grub-pa (pronounced Budon Rinchendub), also called Budon Rinpoche, is held in great esteem by Tibetan and Mongolian learned lamas. It is distinguished from the work of Tārānātha by the plan of its composition. It consists of three parts. The history proper is preceded by a systematical review of the whole of Buddhist lietrature so far as preserved in Tibet, and it is followed by a systematical catalogue of works, authors and translators of all the literature contained in the Kanjur and Tanjur collections. The first part of an overwhelming scientific value. It represents a synthesis of everything which directly or remotely bears the stamp of Buddhism, that synthesis which is also the ultimate aim of the European investigation of that religion. The whole of its literature, sacred and profane, is here reviewed as divided in periods, schools and subject-matter. No one was better qualified for such a task than Budon, for he was one of the redactors of the Kanjur and Tanjur great collections in their final form. As a matter of fact his History is but an introduction and a systematical table of contents to the Narthang editions of the Kanjur and Tanjur. His work has not failed to attract the attention of European scholarship. Wassilieff quotes it in the first volume of his Buddhism, Sarat Candra Das has translated some excerpts out of it. I myself have published a translation in French, in the Muséon 1905 (Notes de littérature bouddhique. La littérature Yogācāra d’après Bou-ston), of the part devoted to the literature of the Yogācāra school, and, in English, of the part dealing with the Abhidharma literature of the Sarvāstivādins, included in Prof. Takakusu’s work on the Abhidharma literature of the Sarvāstivādins. In the years 1927 and 1928 I have interpreted the work to my pupil E.E. Obermiller making it the subject of our seminary study. He then has made an English translation which was revised by me and is now published, thanks to the kind attention accorded to it by the Heidelberg Society for the Investigation of Buddhist Lore and by its president Professor M. Walleser. The translation of the first part, now published, was not an easy task, since it consists predominantly of quotations, many of them having the form of mnemonic verse (kārikā’s). They had to be identified and their commentaries consulted. With very few exceptions all has been found out by E.E. Obermiller in the Tanjur works. The high merit of this self-denying, absorbing and difficult work will, I have no doubt, be fully appreciated by fellow scholars who have a personal experience of that kind of work. Budon Rinpoche was a native of Central Tibet. He lived in the years 1290-1364. He consequently belongs to the old school of Tibetan learning, the school which was preceded the now dominant Gelugpa sect (the yellow-caps) founded by Tsongkhapa. Besides the History he wrote many other works. A full block-print edition of all his works in 15 volumes has recently appeared in Lhasa. No copy of it has as yet reached Leningrad. Among his works there is one on logic, Tshad-ma-rnam-nges-pa’i-bsdus-don = Pramāņa-viniścaya-piņdārtha, with his own commentary. A block-print containing his biography (rnam-thar) is in my possession. It will be analyzed by E.E. Obermiller in the Introduction also dealing with the sources of Tibetan historiography, which will be attached to the translation of the whole work. The Translation is made from the text of the old block-print edition, a copy of which is found in the Asiatic Museum of the Academy of Sciences of the USSR.